At the time of writing this post, I was on the tail end of bronchitis. And a week of choking down horse-pill-sized antibiotics with honey and ginger tea, I needed a pick-me-up. 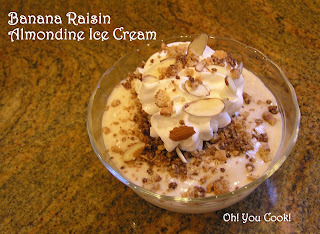 The Secret Recipe Club assigned me to make and post about a recipe from Cooking Whims. Megan happened to have a recipe she adapted from Kraft that made my almost-but-not-quite-gone disease a little easier to tolerate. 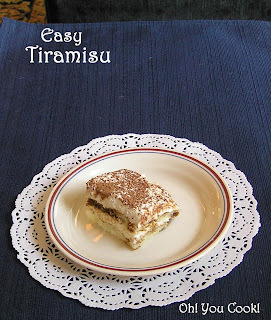 I made Megan's delicious yet easy version of tiramisu. Tiramisu, which literally means "pick-me-up," is a no-bake uber-rich Italian version of an English trifle (or vice versa, I didn't bother using my super-librarian powers to check which came first). What used to be a secret is no longer. The world's easiest ice cream, which I found at thekitchn, has only one ingredient, is healthy and low-fat, and is parve/vegetarian/vegan! If you can operate a food processor, you're gold! You also have to like bananas. Yup, that's THE single ingredient! Easy enough to make every day. Bet you thought it was going to look like brown glop. Nope, it spins into a lovely custard color. Some sites say it's because of the mini-amount of fat in bananas. Others point to the pectin. Whatever the reason, I only see delicious.